The VinaCapital Vietnam Opportunity Fund (VOF) said on Tuesday it has set aside the sum to acquire a significant minority stake in the company. “VOF may also invest a moderate amount of additional capital during the next 12 months as the company delivers on mutually-agreed milestones,” it said. Ba Huan was founded in 2001, growing from a family business to become the leading supplier of pasteurized poultry eggs in the Vietnamese market. 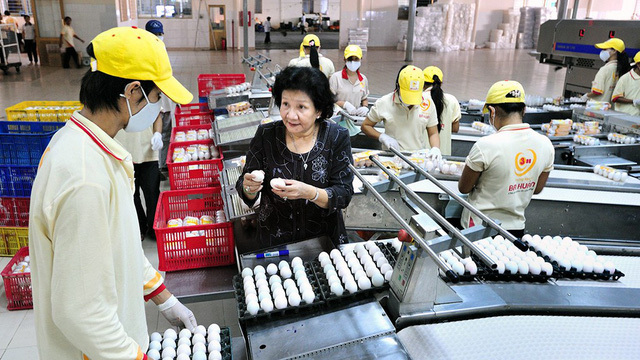 Led by CEO Pham Thi Huan, who is dubbed the Vietnamese ‘queen of poultry eggs,' Ba Huan currently makes up more than 30 percent of the country’s pasteurized egg market. The company operates two fully enclosed industrial poultry farms, including a layer farm with over 1.5 million chickens for commercial egg production, and a broiler farm with over 400,000 chickens for meat production. Ba Huan, which supplies over 1.7 million eggs, delivers over 15,000 chickens, and processes over 25 tons of fresh poultry meat daily, expects revenue to surpass $90 million in 2018. Andy Ho, managing director of VOF, hailed Ba Huan as “one of the strongest fresh food brands in Vietnam,” a country where food safety remains a concern. “Ba Huan’s growth is due to its reputation for producing high-quality and safe foods,” he said. Ho added that the private equity investment is consistent with VOF’s strategy of focusing on companies operating in the sectors of the economy benefitting from strong domestic growth. With Vietnamese food and beverage companies having tremendous growth opportunities ahead of them as consumers spend more on high-quality, healthy products, VOF sees Ba Huan being well-positioned to capitalize on these trends. Founded in 2003, VinaCapital is a leading investment and asset management firm based in Vietnam, with a diversified portfolio of $1.8 billion in assets under management. The firm has two closed-ended funds that trade on the London Stock Exchange, the VOF and VinaLand Limited.